In the August 2014 issue of Macworld you describe a process for moving a Windows Outlook database into a Mac and then into Apple Mail. I’ve been a Microsoft Office for Mac user for a long time but I keep reading about the terrific things that Apple Mail can do, and I’d therefore really like to export my Outlook data and import it into Mail. The process you described for Windows doesn’t work for Mac Outlook email files. Do you know of an alternative process I can use to move my Mac Outlook database into Apple Mail? I do. You can do this the kind-of-tedious-but-free way, or pay for a solution. The kind of tedious way is to launch Outlook, select a mailbox that you’d like to move to Mail, and drag it to the desktop. Doing this creates an mbox file (a file format that Mail can import). Repeat this process for all the mailboxes that you wish to import and then place the mbox files into a single folder. When you’re finished, launch Mail and choose File > Import Mailboxes. A window appears that asks you to choose a source to import data from. Select Files in mbox format and click Continue. A sheet will appear. Use it to navigate to the folder you created for your mbox files and click Choose. 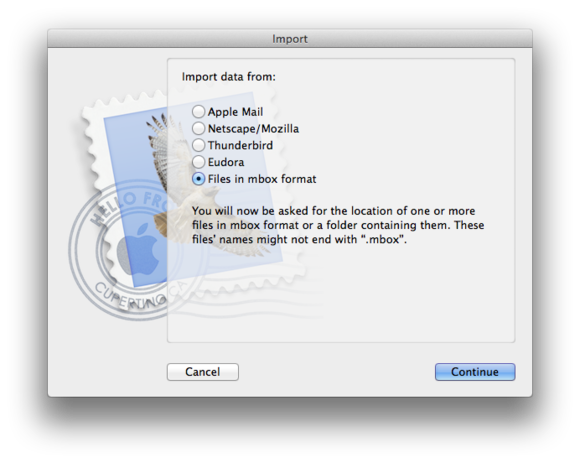 In Mail, choose to import the mbox files you dragged from Outlook. In the resulting window you’ll see all the mbox files it contains, each with a checkmark next to it. If you don’t wish to import messages from a particular mbox, just uncheck it. Click Continue and the messages within the checked mbox files will be imported into Mail. As Mail will tell you, you’ll find the messages inside an Import folder within its list of mailboxes. Not only is this a bit tiresome, but it also does nothing for any contacts and events you’ve stored in Outlook. If you’re looking for an all-in-one answer you might instead pursue a paid solution. I’ve found a couple of utilities on the Mac App Store that will transfer this data for you but since I haven’t tested them, I won’t recommend any one by name. Search for “OLM” and you’ll find a few options.